This month I’m featuring Hailey. She’s a social worker, so I found it really interesting to read how she deals with working for child protective services while also being a busy mom. I don’t know if that’s a job I could do! She’s not a blogger and doesn’t have an online presence related to her job. This is just her real life thoughts and feeling about being a working mom. Hailey chose to respond to my questions in a essay style format, so I will share my questions in a list. Hello internet, my name is Hailey. I’m a married mother of two, ages 3 years and 18 months. 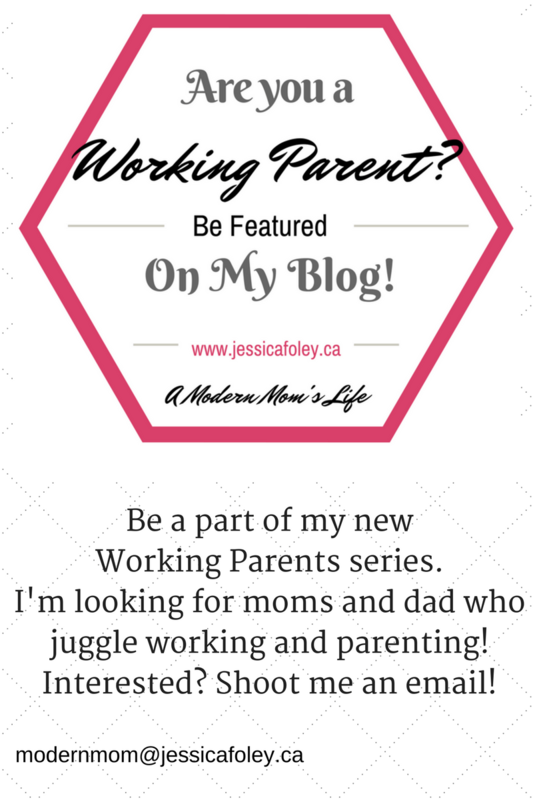 My husband and I both work full time and our kids are in full time daycare and this is my first blog post. I’m definitely not a writer. Well at least not a creative writer. I write all day every day for my job but it’s very legal writing so this is a whole new world. I saw Jessica’s post on Twitter and just decided on a whim I wanted to contribute so please bare with me and we’ll get through this together. I’m a social worker. I work for child protective services and spend my days investigating allegations of child abuse and neglect. Whenever I tell people this I always get the same response, “oh, that must be so hard.” And I’m sure you can imagine how this job can, more often than not, carry over to your home life and it can be difficult to leave work at work. For me one of the hardest parts is I’m an introvert. I spend my days interviewing extremely vulnerable people talking about serious issues that will affect the rest of their lives and it’s mentally exhausting. There are some days I don’t think have any brain space left to deal with my toddler’s tantrum because he asked for fruit snacks but he wanted the red pack, not the orange pack I gave him. But every day somehow I semi-manage to pull it together. I also find I have even less brain space for my husband. I work 40 hours a week. Sometimes more depending on the caseloads. I’m lucky that my job is mostly a 7:30-4:30 job and I’m home 90% of nights to put dinner on the table and eat as a family. Sometimes I have to work late for a home visit or if a crisis has happened. If I need to work overtime to catch up on court reports or case notes I can often log into work after the kids go to bed. When I had my first child I was a full time graduate student working towards my masters in social work. Graduate school was planned, my child was not. So once I got news I was pregnant, and news that I was accepted into graduate school, I decided to try to do both. I literally gave birth to my oldest child on a Thursday and was back in class on a Tuesday. When I got pregnant with my second child I was in my final year of graduate school and completing my internship. I was able to take three months off after I finished graduate school before having to begin working. Luckily my internship hired me on as an employee so I was able to return to a similar routine making the transition a little smoother. As a social worker we are constantly talked to about self care and making sure we are doing something for us so when Jessica asked me if I do anything just for myself I spent a lot of time thinking about the question. My answer is no, not really. At least not something consistent. I go out with friends every couple of months to get a break, I go grocery shopping by myself (I call this my target vacation), or my husband and I will go on a date night every now and then. Recently I’ve started running for 30 minutes as soon as I get home from work and before my husband gets home with the kids to help clear my mind from the day. I’ve found it helps me be more present once the kids get home and helps me shake off the work day. I also watch a lot of mindless television after the kids go to bed. I’ll watch the same show over and over again just so I don’t have to think. I’ve seen every episode of Friends and The Office a million times because I don’t have the energy to start anything new. I’m trying to find a healthier outlet for my “me” time, hence the running. Overall I love being a working parent. I love my job – it fulfills me and gives me purpose in this world. There are times I feel guilty for being a working parent, like when my kid is sick and I have to take him to grandmas instead of staying home, or my kid has a school performance that I can’t attend because I’m required to be in Court. But overall I am content in my role. I definitely get the “Mom guilt” we all feel from time to time. I feel guilty that I don’t do daycare drop off or pick up or I don’t get to go to all the doctors appointments but I also feel empowered by my role in that I’m making a difference and showing my boys that traditional gender roles aren’t the only way to do things. Or maybe this is just something I tell myself to feel less guilty… either way it’s working. Looking forward in my life I would like to continue on my professional path and continue to strive to find the perfect work life balance (which I’m pretty sure doesn’t exist). I want people to know it’s okay if you can’t do it all because it’s impossible. It’s okay to cry and feel overwhelmed. It’s about what you do going forward and the changes you make. I have found there is power in the word no. I treasure my Saturdays. It’s the only day that we are all home as a family. So no, I don’t go to every baby shower or every essential oil or jewelry party, and no I can’t always go see that movie with my friends. We get very caught up in being busy so learning to say no and prioritize what is important has made a huge difference in my life. Obviously no isn’t always an option but when you really get down to it we allow ourselves to feel obligated to things that shouldn’t be taking up space in our lives. This has definitely rubbed some people the wrong way but it’s been so worth it for me and my family. Okay internet, there you have. There’s me as a working mom in a nutshell. Hailey is a working mom of two young kids. She’s married to her full time working husband and together they are trying to figure out how to balance it all.